Brussels, September 28th, 2016. Till December 2018, the IoT-EPI will invest more than EUR 5.5 million in SME, startups as well as university or research projects on Internet of Things (IoT). 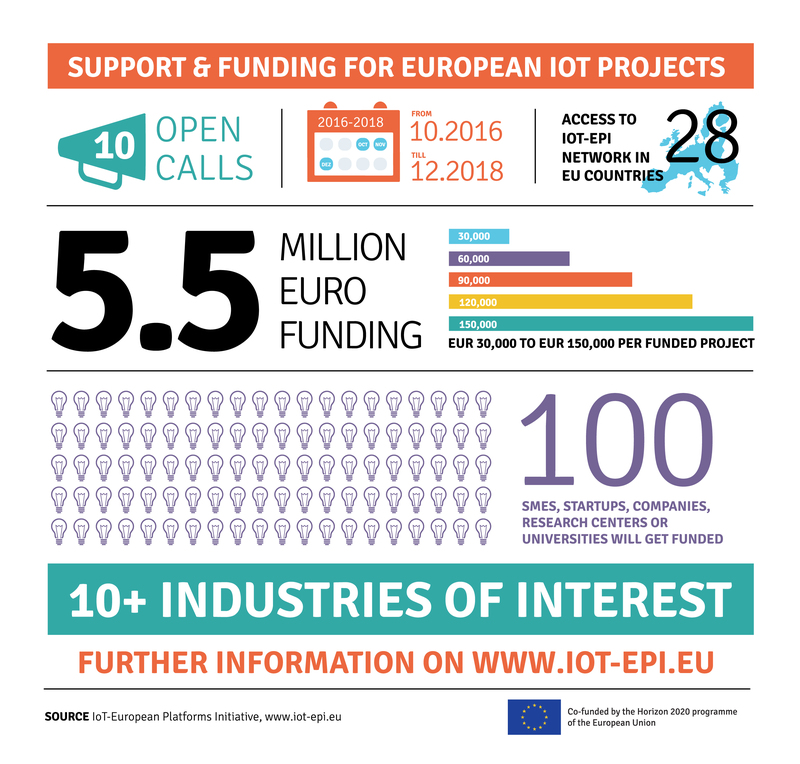 On October 1st, the IoT-European Platforms Initiative (IoT-EPI) will launch the first of altogether 10 open calls to support IoT in Europe. More than 100 projects will get tech support and funding in the amount of EUR 30,000 to EUR 150,000 each. The grants are funded by the Horizon 2020 programme. “IoT-EPI is a cluster of projects which will establish a common knowledge base on IoT-platform technologies. These projects do not only develop innovative platform technologies but also foster community and business building based on these technologies – with the overall goal to create a vibrant IoT-ecosystem in Europe. The open calls will support such an IoT ecosystem by opening up to a large number of SMEs and startups”, stressed Dr. Mechthild Rohen, Head of Unit for ‘Internet of Things’ in the Directorate General for Communications Networks, Content and Technology in the European Commission. The calls are open for SMEs, startups, companies, research centers or universities in Europe and its associated countries. All documents must be submitted in English. Details on the current calls as well as future funding opportunities will be available on the IoT-EPI website shortly before application starts. Moreover, selected partners will offer a number of services to support the applicants, such as a list of Frequently Asked Questions (FAQ) addressing the most common issues, a HelpDesk service where applicants can ask Open Call related questions to the symbIoTe consortium and a pre-proposal feasibility check service where applicants can provide a 2-page description of their proposal and ask for feedback from the symbIoTe assigned experts. Further information on upcoming open calls can be found at www.iot-epi.eu or via the IoT-EPI newsletter.